I am a recent student of the classics. I read a couple in high school for a novels class. But it wasn’t until the last couple years that I’ve begun to both stock our home library with classics but read and learn from them as well. I talked about how I am participating in two reading challenges this year. You can find out about the first one here. This challenge is called Back to the Classics. 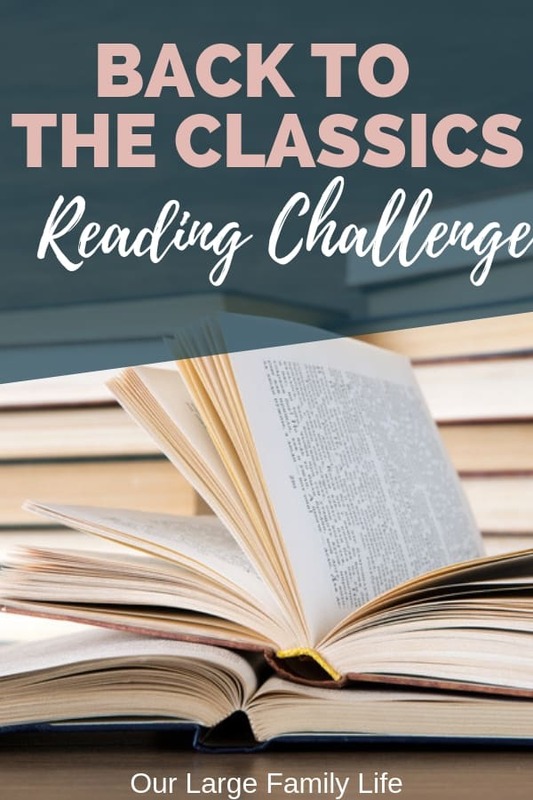 As you can guess, the books being read in this challenge are classics, meaning the books have to be at least 50 years old, or more for some categories. The original challenge can be found here. There are 12 different categories for the books the will be chosen. 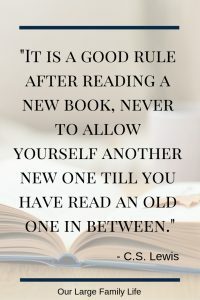 They have to be books you haven’t read before or started in 2018. 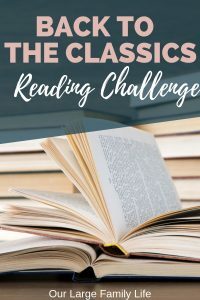 As our homeschool philosophy of education has changed into Classical/Charlotte Mason, I find that there are a lot of books I want to read so I know what my children are reading. I also want to be able to connect what they are reading to other things they are studying such as in their history timelines and how what they are reading was influenced by the world of their time. In order to do this though, I need to know what’s in these books. I read what I can along with them, but I also want to have a knowledge base to draw from when it comes to the classics. That’s why this challenge was a perfect challenge to participate in. Have you participated in any reading challenges? 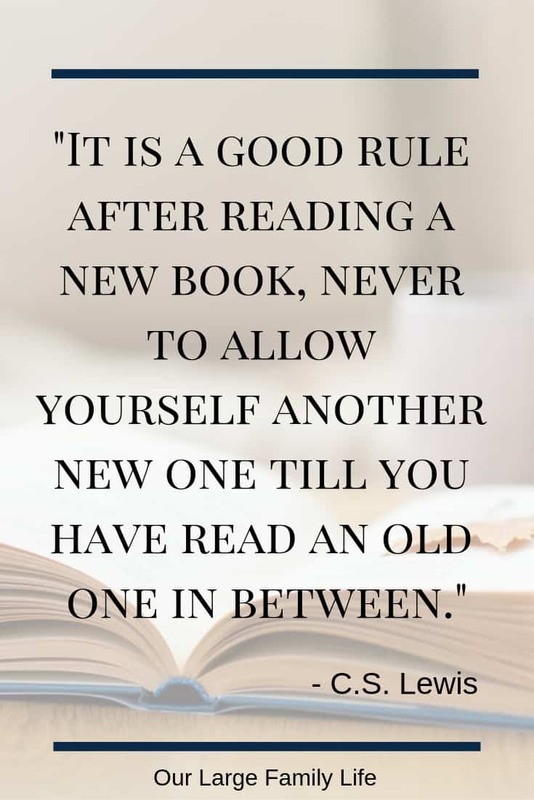 Find out why reading challenges are a good idea! 19th Century- The Time Machine By H.G. Wells. I love a good sci-fi book, so I am excited about this one. 20th Century– A Brave New World by Aldous Huxley. I’ve heard about this one many times, so I thought now would be a great time. Plus I picked it up at a library sale (that’s where most of my books come from) so it’s been on the shelf for a while. Woman Author– Gone with the Wind by Margret Mitchell. I picked this one up at a library sale as well, in an effort to stock classics in our home library. I feel like I may have seen the movie when I was younger but I don’t remember it at all. Comic Novel– The Code of the Woosters by P. G. Wodehouse. I was going to read this book this summer and even checked it out from the library but never read it. Tragic Novel– The House of Mirth by Edith Wharton. I honestly know nothing about this book. I just googled tragic novels because I couldn’t think of any off the top of my head ( because who wants to read a sad story) and this one popped up, so we will see. Very Long Classic– Les Miserables by Victor Hugo. This book has been in my TBR pile for a long time. It is supposed to be read in Year 10 of Ambleside, which I have a child in this year, but want to read it before I assign it. Classic Novella– The Old Man and The Sea by Ernest Hemingway I don’t know much about this book. I googled classics under 250 pages, as that is the requirement for this category and this one popped up. Of course, it’s on my shelf, so that’s why I picked it. Classic From Africa, Asia, Australia- Crime and Punishment by Fyodor Dostoyevsky. I haven’t read any Russian Lit but have a couple on my list that I have wanted to dive into, so I picked this one. Place You Lived– Huckleberry Finn by Mark Twain. We live only a couple hours from Hannibal, Missouri which is where the books were inspired by. I’ve been wanting to read both this and Tom Sawyer to the kids but want to read them first. Play– Much Ado About Nothing by William Shakespeare. When it said to pick a play the only works that came to mind are Shakespeare. As I get ready to do more plays with the kids, it’s a good time to get familiar with them. A couple of books on the list are also from the TBR Challenge. They are some of the longer ones which will work about well time-wise. I get deep satisfaction from the classics I have read over the last couple of years. They seem to take a different skill set to read than more recently written books. With fiction, once I really get into the story I like to kind of binge read until the end. I find I am unable to do that with classics. I have to read slower in order to read through and process all the language that is written, which is a good thing. There is a reason they are called classics, right? They can seem daunting to get into, but it is always so good to be in there once I get started. Plus, I hope to share these books with my kids as they get older.